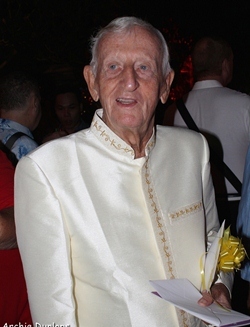 At least 90 well-wishers helped Archie Dunlop celebrate his 90th birthday at the Ban Souy Resort last weekend. Archie remains robust and ascribes his longevity by doing all the wrong things all his life! However, Archie has been known to exaggerate! The birthday party began around the pool with wine and canapés before adjourning to the rooftop where a five-star buffet with oysters, oysters and oysters and all the usual buffet fare. After dinner, the guests wound their way downwards through a champagne ceremony and then back to the pool area for a series of shows imported from Boys, Boys, Boys. A different night celebrating a rather ‘different’ and larger than life character. Happy Birthday Archie! Archie Dunlop celebrates his 90th birthday with friends. Peter Malhotra presents a bottle of wine to Archie. 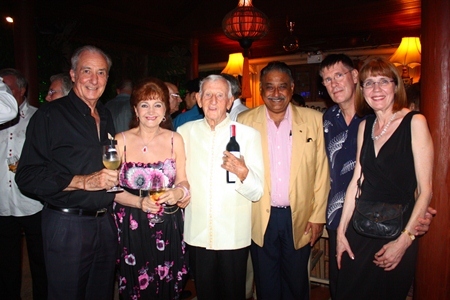 From left: Dr. Iain Corness, Elfi Seitz, Archie Dunlop, Peter Malhotra along with Arthur & Alisa. 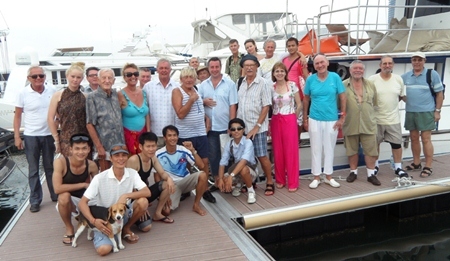 Archie gathers quite an entourage for a boat trip the following Sunday.